The Battle of Gettysburg was fought July 1–3, 1863, in and around the town of Gettysburg, Pennsylvania, by Union and Confederate forces during the American Civil War. The battle resulted in the largest number of casualties of the entire war and is often described as the turning point of the war. Union Major General George Meade's Army of the Potomac repulsed attacks by Confederate General Robert E. Lee's Army of Northern Virginia, ending Lee's attempt to invade the North. 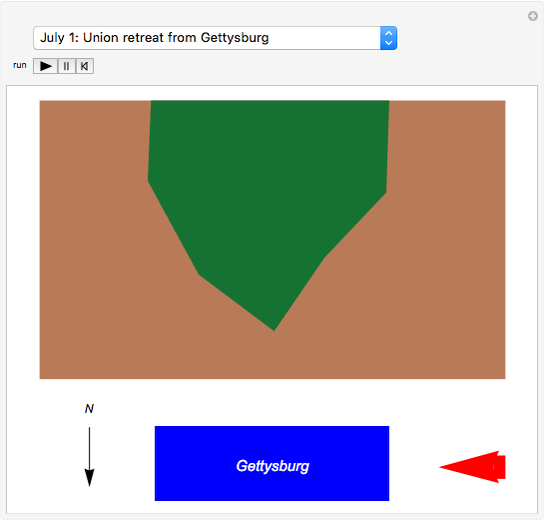 On July 4, Lee's withdrawal took place without pursuit by the Union forces, which had been too worn down by the battle, to Lincoln's great disappointment . 1. 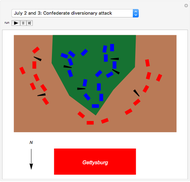 The capture of Gettysburg by Confederate forces and the subsequent defensive retreat of Union forces, assuming positions in a fishhook shape. 2. The frontal unfolding of Confederate forces and the first diversionary attack carried out by Confederate Major General Edward "Allegheny" Johnson's division at Culp's Hill. 3. 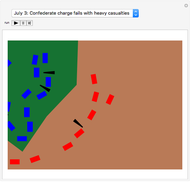 On the third day of the battle, General Lee commanded an infantry assault to strike the Union center. Although some Confederates were able to breach the low stone wall that shielded many of the Union defenders, they could not maintain their hold and were repulsed with over 50% casualties, a decisive defeat that ended the three-day battle and Lee's campaign in Pennsylvania, which ended in the reconquest of Gettysburg by the Union forces . Wikipedia. 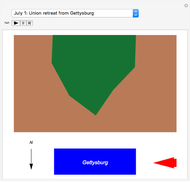 "Battle of Gettysburg." (Oct 26, 2016) en.wikipedia.org/wiki/Battle_of_Gettysburg. Wikipedia. "Pickett's Charge." (Oct 26, 2016) en.wikipedia.org/wiki/Pickett%27 s_Charge. 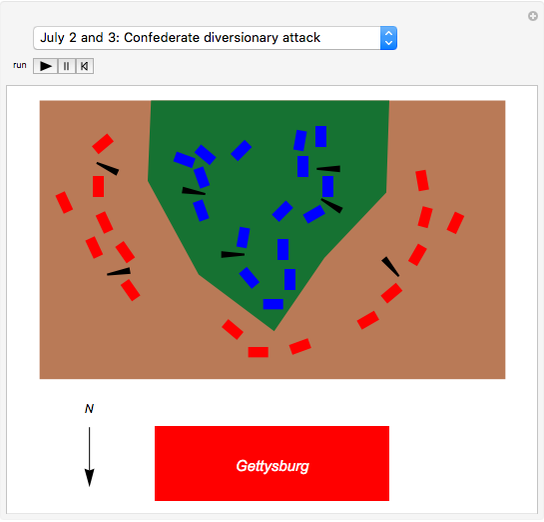 Civil War—Battle of Gettysburg [Video]. (Oct 26, 2016) www.youtube.com/watch?v=YFXLzU0NWVI.